Arsenal beat Tottenham on Saturday but will either side be in the title hunt come May? Arsenal and Tottenham have both proved this season that they are capable of producing performances close to complete. Spurs announced themselves as a genuine Champions League threat with a thrilling dismissal of holders Real Madrid at Wembley on 1 November. And at Emirates Stadium on Saturday, Arsenal looked every inch a title-challenging team as they outplayed and beat Mauricio Pochettino's side. Yet despite these flashes of brilliance, a body of evidence - and brutal reality - suggests the Premier League title will be coming nowhere near north London this season. So why might Arsenal and Spurs fall short again? Intense. Attacking. Creative. Energetic. Irresistible. Those are the words that have been used to describe Tottenham this season. Indeed, there had been increasing whispers that the balance of power - a phrase that stirs emotions in north London - was shifting between these two huge rivals. They would argue otherwise at Arsenal. Tottenham may have been runners-up in the Premier League last season but the Gunners can point to actual trophies, winning the FA Cup in three of the last four seasons, despite failing to qualify for this season's Champions League. Pochettino, in contrast, has not delivered silverware, a point that will be scratched at until he does. Arsenal took this game and dominated it. 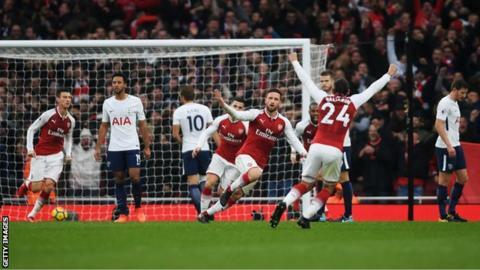 They pressed Spurs into submission, had serious threat in an attacking three of Mesut Ozil, Alexis Sanchez and Alexandre Lacazette, and played with a swagger and confidence their opponents could not muster. It was a display worthy of the words so often used to praise Spurs this season. In every area, Arsenal looked a team in shape to challenge for the title as they reeled off their 11th successive home Premier League win, their best run since winning 13 consecutively at Highbury between February and November 2005. But there is a cold reality to consider here. If Arsenal played like this week in, week out, then they could be proclaimed as title challengers - but they don't, so they aren't. Arsenal do have a quiet consistency about them at home but then images of the horror show at Liverpool, where they were lucky to only lose 4-0, invade the memory bank and title aspirations are doused in cold water. For Arsenal fans, it is the hope engendered by superb performances such as this that kills them. Arsenal played well at Manchester City two weeks ago, and were hard done by on refereeing decisions as they lost 3-1, but no one can seriously claim they are anywhere near the levels of Pep Guardiola's side. They are not alone there, though. It is their inconsistency over the whole season that will undermine Arsenal, as it always does, which makes the authority of Saturday's performance frustrating in so many ways. One way Arsenal may cement their place as top-four contenders would be if manager Arsene Wenger accepted they have more chance of beating quality opposition by fielding Ozil, Sanchez and Lacazette from the start. This was only the third time they have started together since Lacazette arrived from Lyon for £52m in July. He was mystifyingly left out of the defeats at Liverpool and Manchester City - and his withdrawal on Saturday for Francis Coquelin drew a very loud and angry reaction from Arsenal's fans, even though their team were two goals up with 17 minutes left. Ozil's languid style has drawn warranted criticism when he lurks on the periphery but statistics state his importance. Since his Premier League debut in September 2013, he has provided 45 assists, more than any other player in the competition and 21 more than any other Arsenal player in that time. Shkodran Mustafi has certainly been a beneficiary, with all three of his Premier League goals being set up by his fellow German. Arsenal, after wins like this, only confirm their status as a puzzle. They can lift observers and fans to the heights with the purity of their game, but it still does not increase confidence that they will be in the title shake-up. Spurs generate genuine excitement when they get it right - as Real Madrid and Liverpool, also well beaten at Wembley recently, can testify. And yet those nagging doubts about Pochettino's team will not go away until they go to the homes of their closest challengers and put down a marker or two. They lost out to Anthony Martial's late goal at Manchester United on 28 October, and suffered a more decisive defeat at Arsenal. Spurs' last win away victory over another what we might call the Premier League's 'Big Six' - last season's final top six - was a 2-1 win at Manchester City in February 2016. This is not the stuff of champions. Pochettino has lost four of his past six London derbies as Spurs manager. He only lost four of 18 before that. Spurs have lost three of 12 league games this season. They only lost four throughout the whole of last season. For balance, it should be pointed out that they were very unlucky with a decision that led to Arsenal's first goal on Saturday. Davinson Sanchez looked to have won his tackle with Sanchez but referee Mike Dean disagreed. Pochettino also complained that Mustafi was offside when he headed Ozil's resulting free-kick past Hugo Lloris. Important though this was, it was all around the margins. Spurs were listless, lifeless and seemingly lacking the self-belief to take the game to Arsenal, not helped by the fact that Harry Kane - strapped up after missing England's friendlies with Germany and Brazil with a hamstring injury - was so obviously short of fitness. Dele Alli was anonymous and the magic of Christian Eriksen failed to materialise. Spurs are a wonderfully exciting side but until they start winning statement matches such as this, or at Manchester United, then they will struggle to make the leap from second to first. Arsenal and Spurs will be right in the hunt for the top four when the January transfer window opens. It could be a defining month for both clubs. The elephant in the room for Arsenal on days like this, and when they play as they did in dismantling Everton 5-2 at Goodison Park, is the obvious importance of Ozil and Sanchez. They demonstrated total commitment in the win over Spurs, but there remains the prospect that one or both will be leaving, with contracts set to expire next summer and new deals unsigned. Sanchez may go even as early as January, with Manchester City a strong possibility. Wenger said: "I know them well and I know when they go on the pitch they want to win the game and they have shown that commitment again. I never questioned their commitment." He added: "The quality of the contract has to be enough for them as well. I am convinced they love the club, they love the team but the rest will be decided. When, I don't really know." It will leave Arsenal and Wenger in a dilemma come January, particularly as the fight for top-four places behind Manchester City is shaping up to be fierce, with only four points separating Manchester United in second and Burnley in seventh. Do Arsenal risk selling Sanchez and weakening themselves considerably? Or do they keep him for the season to strengthen their challenge at the top end of the league, and risk losing him on a free transfer next summer? As for Spurs, the suggestion that they are "the Harry Kane team", as Manchester City manager Pep Guardiola remarked at the end of September, is nonsensical but Pochettino will surely want reinforcements in January. Spurs lacked cutting edge without Kane at Old Trafford and were impotent again at Arsenal, with the forward out of sorts and struggling physically. Fernando Llorente is a fine player but Spurs may need more. Will Pochettino reignite his long-held interest in Everton's Ross Barkley in January? Barkley, who turned down a move to Chelsea on deadline day in August, is returning to fitness after a serious hamstring injury and is still intent on leaving Everton. If Spurs do move in, they will be targeting a player who might just ease the burden on Alli and Eriksen. He will also be desperate to stake a late claim for a place in England's World Cup squad. Manchester City's unstoppable progress threatens to make the title race a formality - but these are still crucial times for Arsenal and Spurs.